As the capital arose to the realisation of what took place in West London, June 14th 2017, many from outside of the capital may not share the same affinity or emotive response as their fellow countrymen. The reality is that the affinity must be shared by all as this situation is not, and should not be treated as an isolated case. What took place in the capital could happen to any of us in any part of the country as we are all dispensable in the game of ‘Tory chess‘. The inexcusable reality of inequality that is rampant in our societies can no longer be ignored. A ‘timely accident’ in the heart of the capital, where multi-culturalism is widespread, has given life to a previously unimaginable ‘untimely‘ social awakening. The area in question is home to people from all walks of life and social constraints. From rich white to lower working classes of all ethnicities religions and creeds, but what possibly has been overlooked is within the demographics of this area, a thriving community was to pull together and become united in the wake of the tragedy that they had been calling out to this government to recognise for years. In 2009, a fire in the Lakanal House tower block in Camberwell killed 6 and injured around 20. In 2010, a fire at Shirley Towers apartment block in Southampton killed two firefighters and now, 2017, the Grenfell Tower block in Latimer Road, West London that has, on record, killed 58, but off the record, firefighters and eye witnesses are claiming scores more. So why are the numbers so inconclusive? What is there that needs to be hidden? 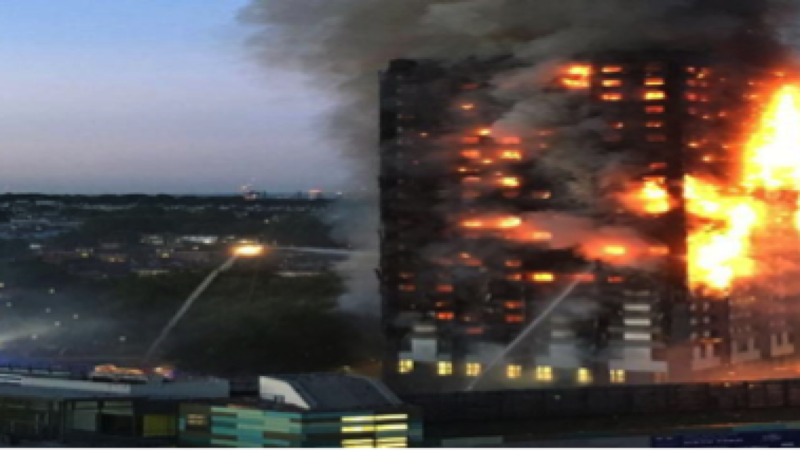 In 2016, Theresa May, along with her government voted against a motion to make improvements to housing, like that of the Grenfell Tower victims, which included a mission to improve fire safety. Mrs. May along with her government felt it was not necessary to treat people in a way that would encourage good living standards in a borough known for its affluence, on the contrary, those living conditions of the obsolete, the unimportant, the poor of the community, was not worth caring for. The newly elected labour MP for the area, Emma Dent Coad, reignited the notion that many residents feared this situation was a means of getting rid of the lower class and making way for the elitists as the council had tried repeatedly in the past to re-house and re-locate these individuals on several occasions not just out of the borough, but out of the capital as a whole. Scores of people have been reported missing and a handful of confirmed deaths, but let us look closey at the situation. At that time of the night, over 120 families and up to 600 individuals all residents of that tower, only 58 people are officially confirmed casualties, while another 74 were confirmed as non-fatal casulaties. That still leaves a staggering 468 individuals unaccounted for that nobody is asking questions about and the mainstream media is remaining defensive over in favour of their loyalist government persona. As can be seen, residents and those affected by this tragedy are asking those questions and this society has awaken in a new reality where their divide is no longer manipulatable by those looking to cause dissent within communities. These people, irrespective of belief, colour and social class has awaken now to realise they are pawns in the game of ‘Tory chess‘ and their discontent is being seen as we speak on the streets of London. Sophie Khan, who acted as solicitor for the families in the Lakanal House fire, told BBC 2’s Newsnight on June 15th 2017 that inquests would be better due to the fact that the public inquiry would be government led and would make it easy for Mrs. May to withhold any further damning evidence against her. Inquests are led by independent coroners and allow the involvement of the people to ask the questions that need asking. The plight of these people fell on death ears for years and only now after their deaths are the people sitting up and taking notice of the warnings. We all, irrespective of location, need to be questioning what in fact went on here as it is reported that across the country there are around 30,000 Grenfell Towers out there waiting for another tragedy to happen for the purpose of hidden agendas being reared by those who have our lives in their hands. We are in a beleaguering situation where we have been made to believe that so many different types of people are our enemies, but in reality, we are all the same and the sooner that realisation comes to pass the better and more in control us as the people of this nation will be. The people of London now have realised it, when will you realise it that the government does not have our best interests at heart. How much do they really care about you? Wake up before the next story being pushed is on your doorstep involving the ones you love. “Grenfell Tower fire: Police open criminal investigation into blaze that killed 17 as fears grow death toll could reach 100”. The Independent. 15 June 2017. Archived from the original on 15 June 2017. Retrieved 15 June 2017.